AFP News is reporting that cabin crew aboard a Korean Airlines flight discovered the body of a 29-year old woman, hanged in a lavatory shortly before the aircraft, a Boeing 777-200, was due to land at Seoul's Incheon Airport. The incident happened yesterday on a flight between Honolulu and Seoul. When the passenger failed to return to her seat, a flight attendant checked the toilet where she found the woman hanging from the wall with a scarf around her neck. She did not respond to emergency medical procedures performed on the plane and was pronounced dead on arrival in hospital. The victim was reported to be a Japanese national. The departure of an Atlantic Southeast Airlines (ASA) flight was delayed for hours yesterday by what an Associated Press reporter referred to as "a mouse intent on flying to Atlanta." 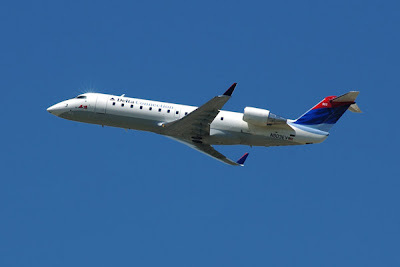 ASA Flight ASQ704 (operating as Delta Connection Flight 704) was grounded for hours at Des Moines International Airport after a flight attendant spotted a mouse aboard the CRJ-200 during a pre-flight safety check. The flight, which had been scheduled to depart Des Moines at 05:50 local time, finally got underway at 11:52. News articles about the mouse incident quoted an ASA spokeswoman who said that all passengers had been rebooked on other connecting flights in Atlanta. It was unclear, however, if the mouse had been trapped or otherwise "deplaned" -- or if the little guy ultimately managed to make the trip to Atlanta after all. I have a cat who could have made short work of that mouse. Maybe ASA should think about asking their flight attendants to bring their kitties to work with them. The airline has generated a conceptual image of the proposed ‘Sleepers Class’ cabin, showing a possible arrangement featuring fully lie-flat bunks stacked three-high in a herringbone layout on either side of the cabin, with additional berths in a wide central aisle. Star Alliance member Lufthansa is considering the sleeper-cabin for specific intercontinental services – possibly overnight flights, such as those to Johannesburg, Sao Paulo and Shanghai – although the carrier says that it has not progressed to the stage of examining potential specific routes. Under the scheme a passenger would opt to book a bed for the flight rather than a regular economy-class seat. It is unclear whether the beds would convert from a seating layout. Looks sorta like an airborne bunkhouse or hostel to me. Would passengers like to be stowed on multiple layers like that? It might add a whole new dimension to all the jokes about pax as 'SLF' (Self-Loading Freight). I have to admit that one of the first thoughts that popped into my head when I saw the photo was what the implications would be for an emergency evacuation. Other safety-related questions come to mind as well. Do the berths convert to upright seats for takeoff and landing? And what if a passenger fell from an upper berth during turbulence? A 36 year old Qantas flight attendant has pleaded guilty to charges that he illegally transported almost two kilos of methamphetamine ('ice') on a flight between Sydney and Perth. Anthony William Dow, who was arrested last year after an investigation by the Australian Crime Commission, entered a guilty plea before the West Australian Supreme Court earlier this week and now faces a lengthy jail sentence. Australian news reports say that Dow admitted to strapping body packs of the drug to himself to get through security at Mascot airport in Sydney before putting the drugs in a bag and boarding a flight to Perth. An article in the West Australian says that Dow "fell victim to well-connected organised crime figures." The article quotes Dow's defense attorney, who said that the flight attendant "feared for his life if he did not transport increasing amounts of the drug for the man, who was a convicted armed robber." The prosecutor contends that Dow was motivated to smuggle the drugs by the lure of money, noting that "the money he received was a significant motivation for him to commence the activities and to continue with it." The prosecutor told the court that Dow had smuggled a number of drug packages on flights between 2004 and 2006, and that he had made more than $100,000 -- much of which was spent on gambling and a lavish lifestyle. Dow, who was a TV actor before becoming a flight attendant, will be sentenced next week.